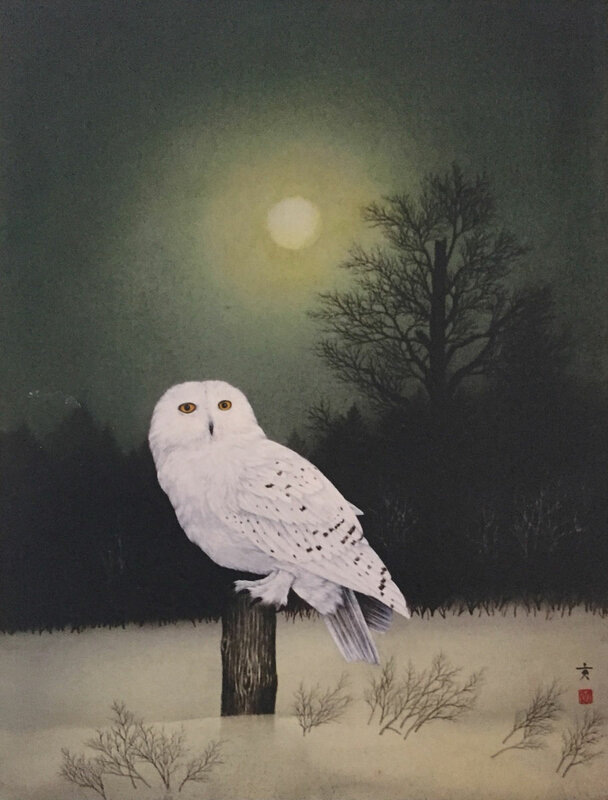 Mitsugi Shinran Kikuchi is a painter who works in traditional Japanese styles of sumi-e (ink brush painting) and tarashikomi (‘drop-in’ method of watercolour painting), and a retired ikebana sensei in the Ohara school. He learned sumi-e and tarashikomi after graduating high school in Japan, and also became an ikebana teacher before immigrating to Canada in 1966 to work for the federal government as a mapmaker. After four years on contract in Canada, he decided to become a permanent resident, and later a citizen in 1977. 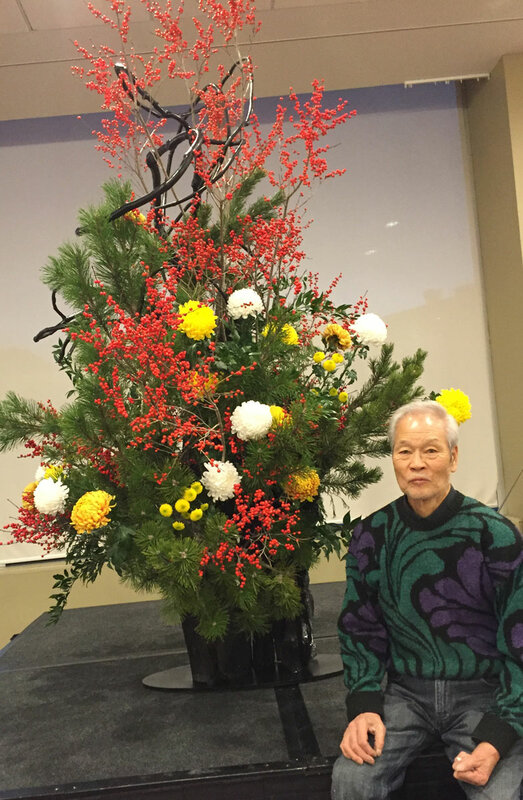 Kikuchi started teaching ikebana in Canada only six months after he first immigrated, conducting his classes with the help of a translator at first, and went on to help found the Ottawa Ohara school chapter. 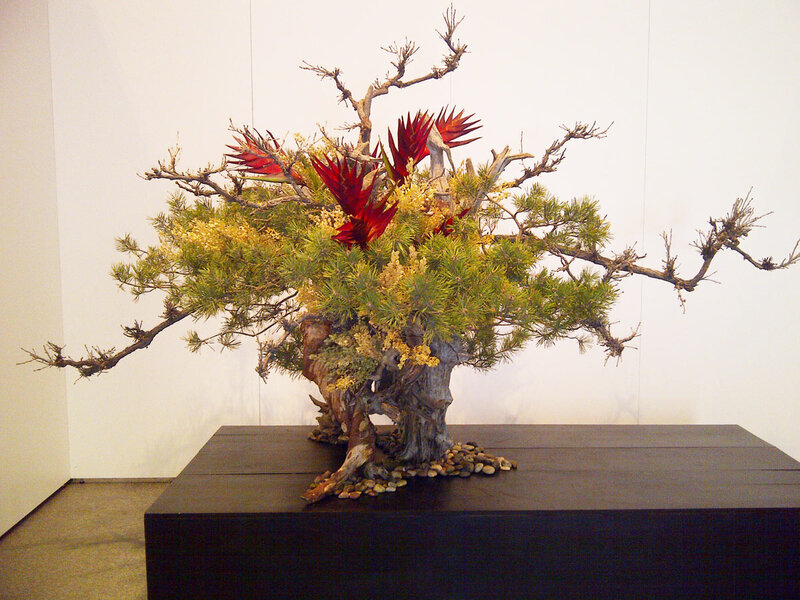 Although he retired from teaching ikebana in 2016 to focus on his painting, he is still asked to be a special advisor by Ohara headquarters from time to time. Kikuchi sees his painting and ikebana as similar practices, with flowers being central to both, and both using the same principles of balance and colour. He uses a variety of techniques in his painting, such as painting watercolours on specially treated birch and cherry tree bark. He is one of the few current practitioners of the 500-year-old tarashikomi painting technique, which fell in popularity after the second world war. In 2018, he will display his tarashikomi work at the Japanese Embassy in celebration of their 90th anniversary; he is also showing work as part of Canada 150 in 2017. Kikuchi has received the Imperial Order of the Rising Sun, Gold and Silver Rays (2012) in recognition of his many years of promoting Japanese culture in Canada, and a Certificate of Commendation, Japanese Foreign Minister’s Award (2002), for dedicated service. His paintings can be found in public and private collections around the world, including the Public Archives of Canada, City of Ottawa, Embassy of Japan, Embassy of Jordan, and many others.